Dr. Marcel Szabó was elected Judge of the Constitutional Court by Parliament on 22 November 2016 with the effect of 1st December 2016. 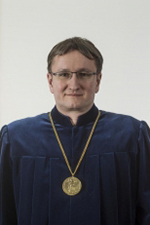 He graduated from the Faculty of Law of Eötvös Loránd University of Sciences in 1994. He pursued studies also at the Stanford University, at the Pangheon-Assas University of Paris and at the Cambridge University. Between 1993 and 1994, he worked at the Department of International Law of the Ministry of Foreign Affairs, later he became head of Department. Between 2011–2012 he represented the Hungarian government in front of the International Court of Justice in The Hague. Between 2012–2016 he is the deputy commissioner for fundamental rights, dealing with the protection of future generations. From 1997 he has been lecturing at the Pázmány Péter Catholic University, since 2004 he has been head of the Department of European Law. He earned his PhD in 2003 and habilitated in 2012.